KCCA team that featured in one of the continental games last season. Some of the players do not feature on the list submitted this time round. Courtesy photo. 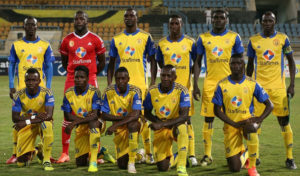 FOOTBALL–KCCA FC start their CAF Champions league journey away to Madagascan side CNaPS sport on Friday. The two-time Azam UPL league giants did negotiate their way past this stage last season and will be hoping for more of the same when they battle CNaPS. “We got past this stage last season and i am confident we can get the job done again,” said a relaxed Mike Mutebi at a press conference yesterday. “It will be a whole lot different as CNaPS play a more possession based style of football as compared to that of Agusto but i hope we will get the desired result,” he added. At the preliminary stage last season, KCCA FC eliminated Angolan side Premiere do Agusto by virtual of away goals as the Kasasiro Boys won 1-0 in Kampala before losing 2-1 in Angola. “We are not going to Madagascar to defend and try to frustrate our opponent like most sides do on the continent,” Mutebi said when asked about the team’s approach towards Friday’s preliminary game. “KCCA FC is not a defensive team and we will try to play our way so as to get the desired result. Our desired result is to win the game and hopefully kill off the tie in Madagascar before the second leg,” he added. KCCA will have to do several senior players for Friday’s game as midfielder Muzamir Mutyaba is nursing a foot injury, goalkeeper Tom Ikara has a shoulder injury and so is Paul Musamali and Jackson Nunda who are still on their way to full fitness after recovering from a length lay off. KCCA FC will hope they can match or even better last season’s exploits in the continent despite several changes to the squad. Last season, the Kasasiro boys where eliminated in the first round of the Champions league and dumped to the Confederations cup. In Africa’s second biggest club competition, KCCA FC went as far as the group stages finishing third in group A and failing to qualify for the knockout stage. The Kasasiro boys also yesterday released a list of 27 players that they will be using at the preliminary stage. The list leaves room for three more players to be added as CAF requires every team to use a maximum of 30 players. It looks much changed from the one the Kasasiro Boys submitted last season as many players have since left and a crop of young inexperienced lads have come in. The surprise omission on the list is goalkeeper Benjamin Ochan who was poised to move to Zambian heavyweights Nkana Red Devils but the deal fell through last month. Once the Kasasiro Boys qualify for the group stages, they are allowed to make some adjustments to their squad as per CAF rules. Maliyamungu Jamil, Lukwago Charles, Ikara Tom, Habib Kavuma, Lawrence Bukenya, Wammanah Ibrahim, Timothy Dennis Awany, Sadam Ibrahim Juma, Okwalinga Solomon, Nunda Jackson, Nsibambi Derrick, Mutyaba Muzamiru, Matsiko Abubakari, Kizza Mustafa, Magambo Peter, Mucureezi Paul, Musamali Paul, Okot Oola Dennis, Senjobe Eric, Sserwada Steven, Kirabira Isaac, Muhammad Shaban, Poloto Julius, Musana Hassan, Okello Allan, Kaddu Patrick, Obenchan Filbert.